For the Taiwan Ministry of Education scholarship candidates, it has been a very exciting ride starting from the moment they received notification of their award. Their excitement escalated as they counted down the days until their moving abroad. 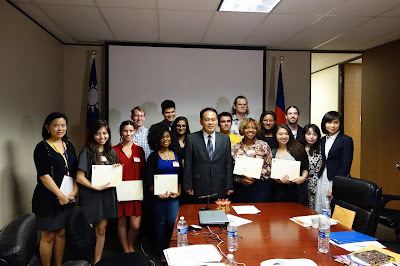 An orientation was arranged by the Education Division of the Taipei Economic and Cultural Office (TECO) in Houston to provide awardees with the information on scholarship rules, visa application requirements as well as what life may be like for foreign students in Taiwan. In addition, the orientation gave attendees an opportunity to meet with their peers in this government funded program before their study abroad journey takes off. The orientation took place on June 15, 2016 at TECO in Houston. This year, a total of 26 candidates were selected by the Education Division of TECO in Houston for the Taiwan Scholarship and Huayu Enrichment Scholarship. Ten recipients made their way to the orientation while the rest were either out of the country or living outside of the state of Texas. As the saying goes, “Everything’s bigger in Texas,” and that held true for a few of the recipients like Andrew, Saba and Nathanial who, despite living within Texas, had to leave their houses early in the morning that day so they could make it to Houston in the afternoon to attend this two-hour meeting. To make the event worth the trip, the Education Division worked extra hard to make sure every little detail was well-arranged without second thought. Director of the Education Division Ms. Sophie Chou started her welcome remarks with huge congratulations to the scholarship recipients. She pointed out that Taiwan has earned its reputation as the second safest country in the world in recent years. To take advantage of that, foreign students should not be afraid of stepping out of their classrooms, meeting local people and immersing themselves in the local language and culture during their stay in Taiwan. Director General Louis M. Huang was invited to give a few words and then presented each student with a souvenir from the Taiwanese government. Three study-in-Taiwan alumni were present to provide attendees with luggage packing tips and preparation suggestions for living in Taiwan. They passionately shared their joyful, eye-opening and unforgettable Taiwan experience at the meeting as well. On top of that, they challenged the attendees to try out a “famous” local delicacy, stinky tofu, when they go to the night-markets in Taiwan. Throughout the meeting, the room was filled with laughter while everybody’s writing pad was being filled with a handful of information that will be useful and practical for their upcoming study in Taiwan. By the end of the session, attendees had established initial friendships with one another, and by trading contact information with each other, they’ve already started planning for their first reunion in Taiwan.